Good morning, Friends! Well, I made it home safe and sound yesterday! It was a beautiful drive over the mountains. And now it's back to reality. Reality hit me a few hours ago with a migraine so I hope that I can keep it in check so I can get some things done today! UGH!! My husband was very nice and cleaned the floors while I was gone and even did some laundry! Woohoo! And then my son decided to do a load last night so he washed some of my clothes, too! I might have time for a nap today because of that!! Makes facing reality a little easier! Have you subscribed to the Create with Connie and Mary Spring Collection? The collection has just started! It's not too late to join! You can join now and still see all the projects and download the tutorials! I hope you will join us! Thanks for stopping by and have a super day! 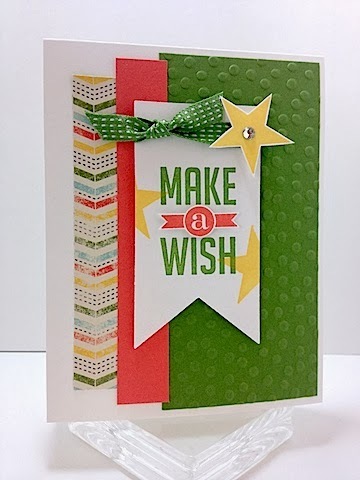 This is such a bright and cheerful card Deb! Lovely!